Leading Manufacturer of mechanical track jack from Kolkata. Matching with the requirements of the clients, we are presenting a quality range of Mechanical Track Jack. 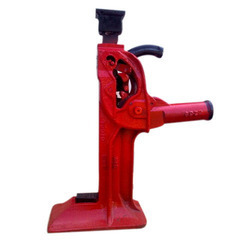 The Mechanical Track Jack is available in various sizes and specifications. Offered products are easy to install and known for rendering hassle-free performance. Features Rugged construction for safety and efficient jacking Alloy steel heat treated multiple pawls for strength and rigidity Alloy steel body and handle for durability. Forged & heat treated alloy steel rack with precision milled teeth for extra service life Large base for stability Tooth by tooth lifting and lowering.